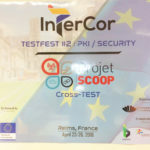 Monday, 23 April 2018 was the first day of the InterCor PKI Security TESTFEST taking place from 23 to 26 April 2018 in Reims, France. The morning welcome session was well attended with about 80 participants to the desk top testing. After solving some expected technical obstacles, all the present teams received DENM (Decentralized Environmental Notification Message) from French and Dutch Road Side Units (RSU).